Waived lender fee on VA loans! Guaranteed Rate Affinity thanks you for your service. We’re waiving our lender fee on VA loans. Veterans and current members of the US Armed Forces can save $1,290 when they buy or refinance with Guaranteed Rate Affinity*. 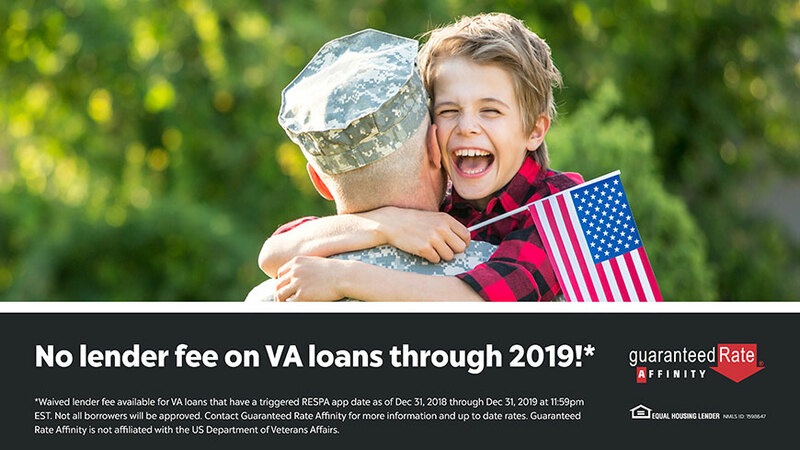 *Waived lender fee available for VA loans that have a triggered RESPA app date as of Dec 31, 2018 through Dec 31, 2019 at 11:59pm EST. ‘Triggered RESPA’ in accordance with Regulation X, is defined as lender receipt of all six pieces of information received in a secure format; applicant name, property address, home value, loan amount, income and SSN. Not all borrowers will be approved. Borrower’s interest rate will depend upon the specific characteristics of borrower’s loan transaction, credit profile and other criteria. Contact Guaranteed Rate Affinity for more information and up to date rates. **Guaranteed Rate Affinity, LLC is a private corporation organized under the laws of the State of Delaware. It has no affiliation with the US Department of Housing and Urban Development, the US Department of Veterans Affairs, the US Department of Agriculture or any other government agency.